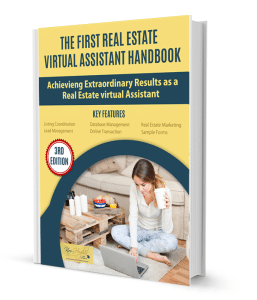 The Real Estate Virtual Assistant Handbook is to be considered an investment as well considered as a guide to offering real estate assistance.Creating a niche to offer a certain industry is not a profession to be taken lightly. You must know what you are doing in order to be successful and you must investment the time to understand what it takes to work in a niche market. Your client’s expectations are high and there is little room for error. This ebook gives you the information you need as well as samples to discover your possibilities. You are not just given a TASTE of information, but detail information as well as samples, links to resources, list of the most popular real estate programs and over 15 sample forms to use in your business as a real estate virtual assistant. As the first real estate virtual assistant and a leader in the industry I am offering detailed information that will help you understand what your client’s expectations are and how to meet those expectations. This will be the best investment you will make for your business. WOW! Being new to the Virtual Assistant world after being a hands on assistant for a real estate agent for 10 years and a licensed real estate agent for 12 years, The Real Estate Virtual Assistant Handbook has instructed me on all the aspects of working with a real estate agent . The instructions gave me exactly what I needed to ensure I offer my clients exactly what they expect and more. This e-book even offered me ideas I have not even given any thought to with examples.